To understand the genocide which occurred in Rwanda in 1994, it is necessary to give a chronological account of its history starting with the arrival of the first colonizers. 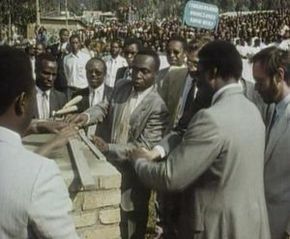 It is through this history, so often falsified by both Westerners and Rwandans, that gave way to the extermination of the Tutis by extremists Hutus. The UN and the U.S. refused to acknowledge the situation in Rwanda as genocide because that would have called for an intervention. The UN Security Council unanimously voted to abandon Rwanda. Through testimonies by three Rwandans who opposed the dictatorship of President Habyarimana (1973-1994), we begin to get a clear understanding of the horrendous mass killings and extermination of the Tutsi people, 800 000 people in close to 100 days. The genocide in Rwanda was the fastest and most efficient killing in history.